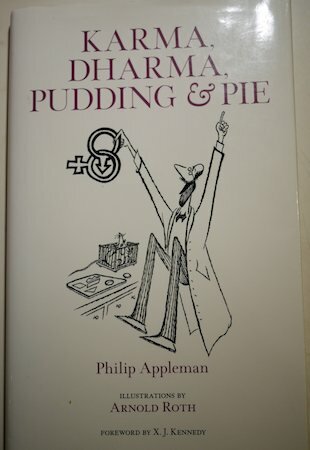 My earlier post on astrology reminded me of Philip Appleman's book of poems Karma, Dharma, Pudding & Pie. One of my favourite poems is entitled "Horoscope". Here is a short excerpt from that poem for your enjoyment. Back in college I had a girl friend, Sue, who'd never heard of the Second Law of Thermodynamics, and couldn't have cared less that E=mc squared: and if you asked her who Darwin was, Sue'd say he's a theory, not a fact. But there was this one Indisputably Scientific Thing Sue saw so clearly: that the sun, due to Electro-Magnetic Vibrations, Dominates the Personality--give or take some minor manipulations from the Moon, Which, as everyone knows, rules the emotions; Mars and Venus, which govern speech and love; et cetera, et cetera. No use objecting that she was dishing out a lot of pre- historic goulash cooked up by the Chaldeans (and if they're so smart, where are they now?) -- Sue wouldn't listen. I should have dated that other girl, the down-to earth geology major, and gone somewhere and hammered. But Sue always seemed so happy. We were "Getting Along So Well," she said, because our Signs were Compatible-- the stars and planets had got us matched up right, like a cosmic computer date. I highly recommend picking up this slim, but pricey, book. It is full of wit, humour and wonderful illustrations.